We sat down with Randy Lowe, one of our product specialists, to get some answers to commonly asked questions. Having worked with individuals and small businesses for over 15 years now has given Randy some perspective on the challenges customers face when shopping for office furniture. What is the Best Office Chair on the Market? Randy: When people say best, they often mean most comfortable. Comfort is a personal opinion so it’s really up to the individual. There are numerous office chair choices on the market and many people use online reviews to help them decide. While I found this a great starting point, one will find a biased points-of-view in any review. There really isn’t one chair that will solve everyone’s workspace or health issue. It really takes understanding your individual needs. That’s why we work with our clients to help understand their situation so we can make the best recommendation for them. Will “This Office Chair” Alleviate My Work Discomfort? Randy: No single piece of office furniture can provide full-body support. A good ergonomic task chair doesn’t solve all your issues but it’s a great first step to supporting key areas of your body. There are a plethora of office furniture solutions available that can enhance a workstation to maximize comfort ― lighting, monitor arms, keyboard arms, footrests, even the office desk itself. When you’re suffering from discomfort while at work it’s important to take the entire workstation into account. What Office Chair Do You Sit In and Why? Randy: I sit in an Embody® by Herman Miller®. I find the backrest is more narrow than most chairs which allow for greater freedom as I move about in my workstation. The Embody’s backrest is very flexible and offers greater support than most off chairs. The seat is also designed nicely so it allows more leg positions without the frame or other parts getting in the way. What Separates Us from Other Furniture Retailers? Randy: Our high-touch shopping experience. If you give us a call, you get a person who can help you. That’s not something that you can get at a big box store or online warehouses. 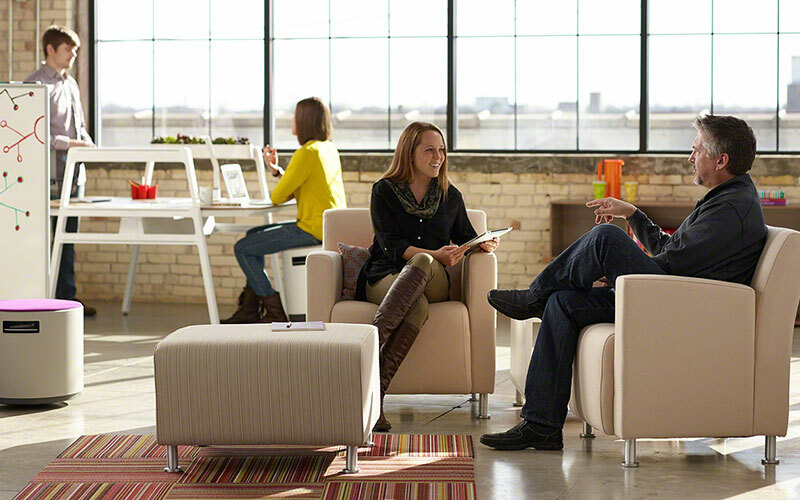 Shopping for office furniture is often overwhelming and confusing. That’s why Office Designs is here — our team’s training and experience is unmatched. Many of us have been assisting clients for 10 years or more. We use our collective knowledge to outfit all kinds of workspaces from personal offices to full small office suites. Thanks for taking the time to answers our questions, Randy! If you have a question for Randy or one of our other product specialists, give us a call at 877.696.3342, 7 am – 6 pm CST M-F.